We are engaged in the sphere of manufacturing and exporting a wide assortment of Industrial Wooden Boxes, which are efficient and robustly constructed to offer high level of satisfaction to our clients. Due to our latest manufacturing facility, we are able to provide the customized solution within the stipulated time frame. 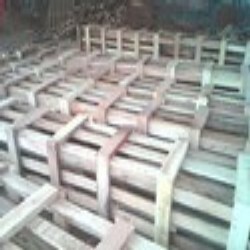 We basically manufacture packaging products in Wood such as packing cases, drums, crates, and pallets including supplying of wooden logs as well in Ahmedabad. Our company is associated with highly placed names in various industries ans we are known for meeting their requirements on time with a proven quality. Ours is a name for most reliable and dependable service, and ability to meet our customers’ complete range of needs in wood. Our products are all available in different specifications and sizes, lengths, and dimensions. The outstanding features of our products are known for resistance towards shock, minimum permeability and good stability. very needed all adverse situations.